Categorically, all of the above. Building the future world of construction. John Deere is a globally recognised company with an iconic impact. Their products have been shaping and leading industries for decades. Helping businesses in construction, agriculture, and beyond, become more profitable, productive, and competitive, for over 180 years now. Designworks has been working together with John Deere for over 20 years, helping them visualise how to maximise their impact in the construction industry, 10 years from now. 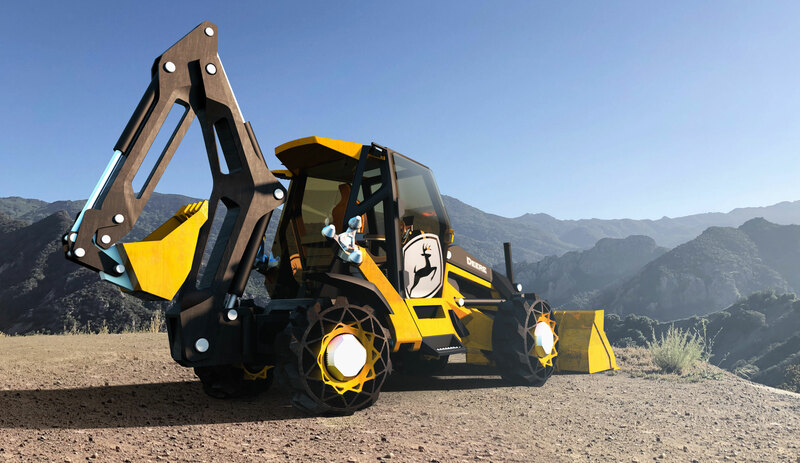 The Fixstern Backhoe is a visionary concept that leverages emerging materials and technology beyond its own industry and 'comfort zone'. “BMW is continuously working on innovations to headline the radical change in our future mobility. Through Designworks we are able to share knowledge and inspire change and transformation in other industries, which is important not only with regards to product design or connectivity but especially when it comes to sustainable solutions for the future”, says Adrian van Hooydonk, Senior Vice President BMW Group Design. The future is no longer independent products but rather systems that must work together, or they do not work at all. Construction is a complex system made of people, machinery, intertwined tasks and processes. The more in sync, aligned and connected those elements are, the better the outcome. We saw a possibility for John Deere to deliver a solution that would go beyond the singular product-model. A framework that would allow all parts of the construction Eco-system to work together, fast, efficiently, and with paramount safety. An intelligent lightweight machinery built for heavyweight future impact. We centered our solution around the industry’s most fundamental cornerstone - the iconic backhoe. Through an extensive research process we developed and redesigned it, with a future context in mind - efficient, sustainable, connected and user-friendly. Thanks to its increased intelligence and connectivity it’s doesn't only improve the individual experience and performance of the operator, it also increases the efficiency and productivity of the construction process, as a whole. Designing with future context in mind. Combining physical and digital expertise throughout the design process.